The Land of the Rising Sun Expands! The quest to unleash the first of the Kami continues. Almost a third of the way to have the Moon God's presence felt across the land! Perhaps we could use a little help pushing us there more quickly? How about something created completely to answer the backers' demand? You want a bigger board? You get a bigger board! For $30 this Optional Buy gives you a Kickstarter Exclusive oversized Rising Sun board made of neoprene! While the standard cardboard board that comes in the core box is able to accomodate the figures just fine, occasionally some more contested provinces may get a little crowded in the late game. So if you want a little more breathing room, and a more impressive presentation, this Exclusive playmat board will be 20% bigger than the standard board! Please note that the graphic design of the Playmat Board will still be adjusted a bit. The card and token slots will retain their original size, meaning the art will have even more breathing space. Click to see a higher-resolution image of the board. If you're interested in purchasing this optional buy, please just click the "Manage Your Pledge" button on the Rising Sun Kickstarter page and in the pledge manager add the amount of the item you'd like to get. We'll sort out what your extra money is going towards after the campaign has closed and we've sent out our Pledge Manager. Wuktrio, Pedro, and 185 more people like this update. haha I just saw Chuck's math after doing my own and I got the same result. 44% bigger is a large improvement. i was already getting it, but I like the stitching and the way it looks. So it's actually better than 40% bigger! Any update on the artwork for this mat? So if i understand correctly, if I want to buy this map, I need to do it now before the campaign ends and not when the Pledge Manager comes out? So basically now we are doing the extra optional buys in advance? @CMON, People on the fence are still waiting for a reply on the playmats transport. It would be of benefit to your campaign if you could answer us. To be sure. Backers who buy bigger map get both maps. Small one will be included in the box, bigger one will be rolled. Am I right? I have a standard sized poker table, and I just measured it at 40.25" across the playing surface. Since this mat is 1.5 inches longer than the table is wide, can we just curl up the ends a bit (as I assume it will come rolled) and play on it just fine? Or will that be an issue? I dunno, after Xenoshyft's mat I'm really not that worried about a mat for this game. Seems a lot easier for me since I tend to spend a lot of careful time bending my game boards so they're not bendy or warped - this saves me that hassle. Get it if you want it, don't if you don't. Changed my pledge. In for a Mon in for a Shu. At this point the value is so good either way I'll feel like I'm getting a good deal. Besides, if the print isn't 100% (the tech for making really good mats is great right now) then it'll make a great MtG playmat or a good desk mat. Still no official post about packaging/shipping of the mat - folded/rolled? @CMON, will the mat be shipped in a tube? Just want to know if you guys are going to fold it or roll it. Ben is right, you fold it, the mat is useless. My friend had a game called cube quest I think, the manufacturer folded the playmat, the crease won't go away ruining the playing experience. I do wish you would have done the bigger board like Scythe did theres. But non the less it is a nice addon. Bigger is better for that sort of huge minis, for sure. But having to deal with disproportionate shipping costs, buying something for 30 bones that might be exhibiting creases and bends, and finding out Thiago was right all along (everything fits after all)? Nope. Like space, make it cardboard! Yes, they aren't going to pay someone at the factory to rip open just your box and remove the board from it. @CMON If I upgrade for this play mat, will I still get the standard game board? I love the idea of a bigger board, but as others have said, I will only get it if it's cardboard and fits in the box. I just don't have the room/desire to store random mats rolled up somewhere to break out for a specific game. After Scythe's innovative bigger board (which fits in the box) I'd say neoprene mat just doesn't work for me. Lower print resolution that a regular board, and storing mats in my collection / packing them for games is far from convenient. Plus unless CMON are wearing the cost of shipping them rolled up, and not folded, they are going to arrive overseas with a crease that the best iron or heavy book combo will never get out, after such a long period being folded in transit. No matter, it's $30 saved. But with all the extra stuff we are getting with this game, better storage solutions to get everything in one or two boxes would be ideal. Although I am expecting an after market solution like Broken Token's Blood Rage insert. I'm a collector, so I want my games in ideally one box, worse case two... Lots of little boxes and plastic inserts (to chuck away) is a sad waste of packaging and useless for storing / taking to game sessions. Just my feels. As always, base pledge is full of amazing goodness and ridiculous amount of value. But as clearly crazy successful as the "tons of extras" model clearly is, I do miss the pragmatism of Stonemeir and others of providing a pragmatic box / storage option as part of the KS delivery. Does anyone know of a good mat bag that would fit this? Thank you. This is a great add on! For the backers that don't need or like this, I hope the next add-on is one you want. It is worth keeping in mind that nothing CMON can do will please everyone all the time. The best they can do is give us a selection of things which increases the likelihood of pleasing most people sometimes. I hope that CMON will change the neoprene board to cardboard, or that they will make the cardboard base game board bigger for all backers instead! The idea is great!!! Just not in the right material. I would rather pay an extra to get four Blood Rage exclusives monsters, than to pay for a neoprene board that won't fit in the box! Skimmed through comments & didn't see it specifically so sorry if this is a repeat question, but if I upgrade for this playmat, will I still get the standard game board? With the neoprene does it crease or roll up on you or does it lay flat? This is the same material that they make magic play mats out of? The standard board is fine for the retail version but once all the KS clans have been unlocked we'll need the bigger map to play 8 player games. upgraded the pledge ;) just could not resist such a cool mat :P !! love the mat, excellent addon! NOTE TO SELF: refresh the comments section before posting! Not to be too "mathy" by increasing the length and width by 20% each means 44% larger surface area! Playmat, as someone posted, is 44% larger than the board. If this mat is not your thing, do not add it on. I personally want it due to the fact a 6 player game could easily be played on a large table with plenty of room for everyone. This is a great add on, IMHO! Love the neoprene map ! FYI custom playmate are usually pretty pricey. I created one for Netrunner and the best deal I could find was ~$25...only $5 less and much smaller! This seems like a killer deal. That's a nice looking mat! And once again we have people on another kickstarter, who apparently do not realize many of us actually have gaming tables that are large enough to support our hobby. So why all the hate from those of you who don't want to support this addon? Move along and let the grownups have some fun too. And no it will not fit in the box and no that isn't even a factor. The regular map still comes in the box for you guys who are crying about it.lol. Sheesh! So Kansai can be approached by 2 provinces on land (and 3 by sea) and provides three rewards. 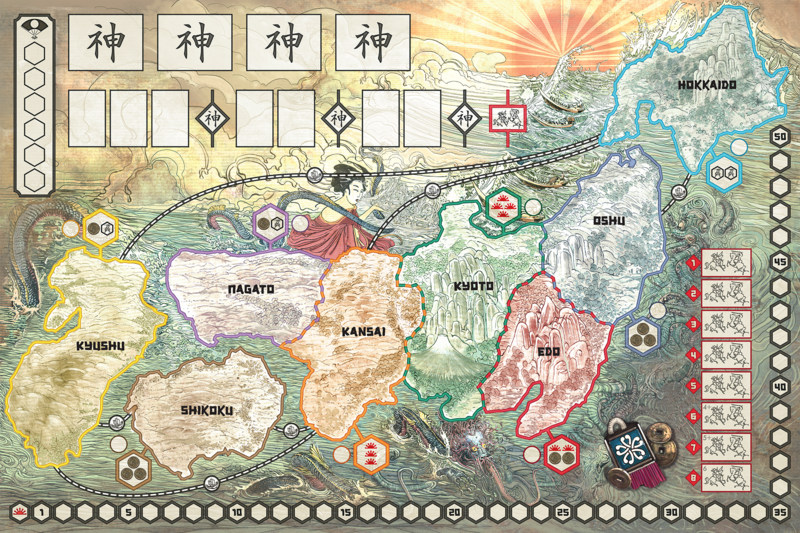 But Kyoto can only be approached on land by 3 provinces, but provides 4 rewards. Am I reading this right? can we get one of these for blood rage with valhalla included? Will this fit in the box ? ROFL "Computer says no" and "here's your sign". Why is everything fitting in the box such an issue, all the KS exclusives will be in a separate box from the main box, only the upgrades will be in the core box, look at the graphic on the campaign tab. Agreed, those circles next to the resource hexes are for the war order numbers. In the 3D setup shot, you can just barely make out red circles on them, which matches the graphic design of the war indicators (red marks with numbers).